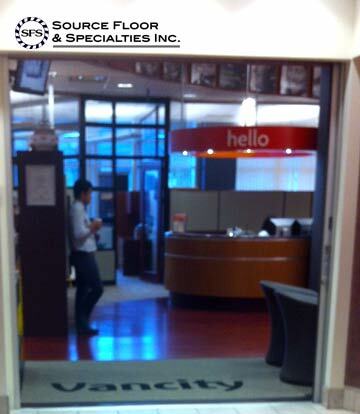 Vancity Brentwood - Logo Mat - Commercial Flooring & Mats Vancouver | Source Floor & Specialties Inc.
We created this custom-shaped logo entrance mat for Vancity’s Brentwood branch. The custom shape was cut to fit on-site to perfectly match the curve of the mat to the curved wall in their customer lounge area. We also centred the inlaid logo in the main entrance doorway to the branch. We used our Grizzly FX in “Sand” to coordinate with the branch’s existing colour scheme, and it looks fantastic!